Home / Niantic Seal Inc. / About Niantic Seal, Inc.
More than just a leading distributor of premium sealing products, Niantic Seal is also a highly integrated customer resource combining a full complement of application and design expertise with extensive materials knowledge. 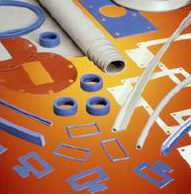 This includes Niantic's custom fabrication capabilities, covering a broad range of engineered seals, die cut/molded parts and specialty hose assemblies. Our technically-trained specialists work in collaboration with you to develop high performance, cost-effective solutions. We further employ the resources of a fully-equipped applications lab where our engineers and production personnel work in concert to design, fabricate and measure products to exacting quality control standards that are both repeatable and documented. The Niantic team stays with your project through its entirety, making certain our engineered solutions not only meet, but exceed your expectations for performance, reliability, quality and delivery.